Hotel La Perla charming chalet-style lodge is located in attractive alpine village and it's surrounded by the spectacular peaks of the Dolomites. Mellow timbers and local artifacts highlight the rustic decor. Accommodations include Tyrolean-styled “Romantik" Rooms, with spacious living/dining areas opening onto balconies offering breathtaking views of the mountains. La Stüa de Michil, a 1 Michelin star restaurant open in the evening. The property includes a green outdoor area with trees, a heated swimming pool and a tree house. The Mahatma Wine Shop, well-loved wine cellar. It contains 30,000 bottles, with 3,000 different labels. This is a truly special and remarkable hotel with spectacular views from the room, genuine and friendly service and unusual and tasty local food. No children's menu but they did offer to make something off the menu, although our children preferred to experiment. 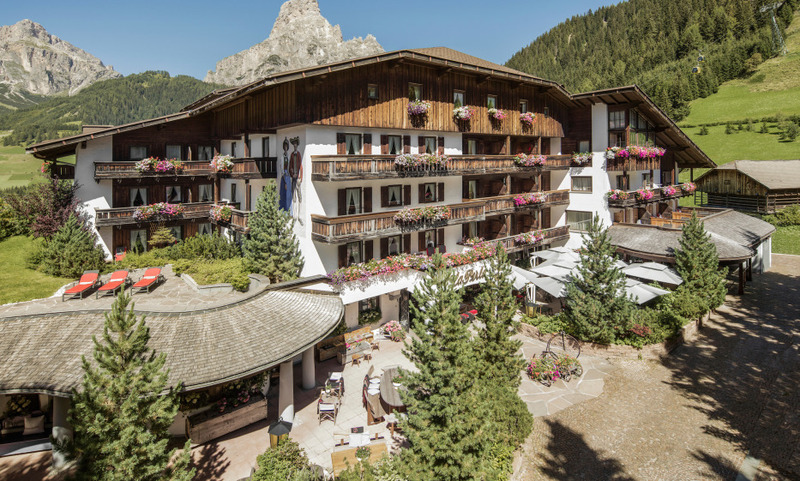 The spa was excellent and the La Perla speciality massage was very relaxing but invigorating at the same time.. Corvara is a beautiful village with lots to see and, many interesting places to visit, we would definitely love to add this hotel to our specials list for a return visit.